It was a dark and stormy night, following up a very, very long day... the storm had come up out of the Everfree Forest as if from nowhere. What had been scheduled as a calm, peaceful afternoon that was slightly cloudy and with a touch of a cool breeze ... had turned into gale-force winds in a matter of twenty minutes. Dash had led the Ponyville weather team in against the gale, but it was no local mess - She heard reports of flooding as far south as Dodge Junction, and tornadoes as far north as Stalliongrad. It was a doozy, that much was certain! Time after time, she'd pulled back to build up a new front of conflicting air and brought it in to break up another segment of the storm, yelling orders with her powerful set of lungs to ponies she could see as no more than silhouettes in the volatile storm, except when the frequent flashes of lightning showed her that she was no longer giving orders to Ponyville pegasus ponies - but complete strangers. No matter, she had authority, and every pegasus was on the same team in an emergency like this! It wasn't long before they knew they'd never be able to give that peaceful summer afternoon that they'd promised Equestria ... nor even a peaceful night. The best they could hope was to break the cyclonic thunderheads into 'just' a powerful thunderstorm, sparing Equestria as much destruction as they could. By the time the storm had finally been broken, it had swept across most of the Nimbusgait Lakes, and by asking the local ponies where she was, she could only determine that she was somewhere north of Canterlot. And apparently, it was well after midnight. She'd been fighting the storm nonstop for more than half a day! Once the adrenaline wore off, the weariness set in quite quickly. No way she was making it back to Ponyville without a rest, not in the storm that still roared outside. She flew heavily over Canterlot with wings that felt made of wood, landing heavily before one of the few places that still looked open. Ponyland, a nice looking little jazz club. She stepped inside, and with aching hooves she peeled off the leather helmet and the goggles that were misting up her vision. Her coat shivered as she shook off sheets of rainwater. She ran her hooves through her tamped-down mane, but nothing was getting that to stand up again anytime soon ... no worries. Not like she'd meet anypony she knew here at two in the morning, other than the fellow pegasus ponies that were landing along with her, eager to get a drink and celebrate a job well done. Cloudchaser groaned loudly as she slowly opened her eyes. The dark of a stormy night sky came into focus and with it the realization that she was lying face up in a large puddle of water somewhere. She gave a yawn as she slowly forced herself upright. Gah. What had happened? Where was she? She brought a hoof to her head to find, that not only was there a sizable bump there but that her beloved mane had been completely disheveled by the elements. Sitting there in the puddle for a moment, she tried to piece things together. That's right, there had been a rogue storm out of Everfree. Rainbow Dash had gather together the entire team to fight it, but it had just kept growing like nothing else. They had all gotten scattered and shuffled up until Cloudchaser no longer knew where she was. Then... Then what? Some kind of debris had hit her and thrown her to the ground... or something? That's where her memory ended. She could only assume she'd been lying here in this puddle since. Shaking herself off and struggling to stand, she supposed it could have been worse. In a storm like this she easily could have drowned or something. Finding her hooves, she looked around, trying to figure out where exactly she was. Looked like a park or something. Wasn't any place in Ponyville at the least. Walking ahead, the carefree pegasus soon recognized the architecture of the city built around the park. She had never been here before, but she knew what it was supposed to look like. Looking around, she had to admit it was pretty nice, even after having been beaten by the storm so hard throughout the day. Evidently it was really late though, as everything was all closed and stuff. Trotting along, Cloudchaser sighed. Here she was in an unfamiliar city, all alone in the middle of the night. Worse yet, the whole place felt empty and kind of shut down. This kind of wasn't good. Making it back all the way to Ponyville didn't seem like it was going to happen that night, especially not with the storm still out, her body all sore and her suffering from a bit of a headache. She needed to look for someplace... anyplace that was still open. Just then, she saw it. Right out of the corner of her eye she noticed a place that still had its lights on. Ponyland, a jazz club. Nice! Cloudchaser liked clubs. They reminded her of her days back in Las Pegasus. Jazz was pretty cool stuff too. Somewhat excited, the young mare skipped ahead, making her entrance into the club. Looking around, it seemed like a pretty happening place, even if its wasn't super busy. She supposed this wasn't too surprising; it was probably super late after all. She looked around a bit more for a while... then she saw her! Cloudchaser started to smile. She totally hadn't been expecting to see a familiar face in this place. Eagerly she cantered toward an all too familiar colorfully-tressed mare. "Rainbow Dash! Hey!" she called out as she approached. "I didn't know you were in Canterlot?" The carefree weather mare gave a short laugh. "Then again, I kinda didn't know I was in Canterlot until a few minutes ago either!" she added with a blank smiled as she rubbed a hoof through her still wet mane. Martini Paradise wasn't a regular employee at Ponyland - she was a temp, hired thanks to Meadowhawk's recommendation, a kind and attractive Wonderbolt. Martini had gotten a gig for a private Wonderbolt party, and had stayed on a little longer. She hoped that perhaps this could develop into a permanent gig - something that had evaded her despite her best efforts. She'd worked at odd jobs all over Equestria, and lately had finally been able to get back into her chosen profession of bartending ... and in all that time, she had gotten a feel for how a lot of different sorts of ponies felt about things. One thing she knew without a doubt was that after a horrible storm, the weather ponies needed someplace to wind down and recover, and today had been a genuine major weather emergency! She'd volunteered to keep the bar open late, so that no matter how long into the night the pegasus ponies had to work, they'd have someplace to go once it was done. As the night had worn on, and the regular customers had all gone home, she'd had entirely too much time to worry. She'd heard stories throughout the day about tornados and flooding and horrible weather all up and down the Everfree ... and Ponyville, where her daughter Sunrise Beach was living, was right on the edge of the Everfree! Was she OK? She didn't try to brave the storm with her normal filly bravado did she? Martini couldn't do anything about it for now, just run the bar and hope for the best, but that didn't stop her from worrying. As the night wore on, and the rain kept battering the streets outside in sheet after sheet, and the thunder rumbled in the distance, or cracked sharply overhead, she was wondering if she'd made a mistake. It didn't seem like anypony was going to show up! Were the pegasus ponies still too busy, or had they just been so exhausted, so late at night, that they'd simply decided to go home instead? But still, she kept the lamps burning, just in case. And finally, her patience paid off, as a rainbow maned pegasus pony came in all drenched, followed by a lavender one with an ice blue mane; both looked as if they had a really rough day. Martini smiled warmly, and with relief. This meant the worst was over, and it was all safe now. Now it was her turn to make them feel safe, and welcome, and warm, away from the drudgery of their work. "Welcome to Ponyland! Come and sit for a spell and relax your weary wings, that was quite a squall out there you've been reining in. If there is anything I can get for you, just ask away. Name's Martini Paradise, and I'm your host for the night!" The storm had been horrible. When he'd heard about the incoming weather system, it had been as a warning to evacuate Cloudsdale. Normally ponies like him, athletes and performers, wouldn't be part of the weather control, but Soarin' had volunteered. After all, they were supposed to be heroes, right? The first hour had been the worst. His uniform had been torn along one side by a chunk of hail thrown off in the upper reaches of the thunderheads, and the gusts of wind and rain and hail had eventually damaged it to the point that Soarin' had landed and taken the remnants off just to give himself more control in the air. After that, he'd hung back and followed orders, breaking a cloud here, pushing one there. After all, most ponies saw him only as a blue pegasus with a sopping wet mane without his uniform, and he was tired of yelling to correct that as it was. "Uh, hello? Sorry to barge in if I'm not allowed, but it's really late, and I was wondering if there was someplace dry I could hang out until morning." He announced, by way of seeing if anyone was there, and if he would be allowed entrance. The place was warm, and dry, so that was a plus, and the music was pretty cool. Even if he wasn't able to see much clearly or wasn't going to be allowed to stay here, he liked the place already. It was rare that Wind Rider left his hometown of Hoofington, with his job as forest ranger keeping him busy there. However, that day was different. The freak storm off the Everfree had taken him totally by surprise, and he'd helped first with the preparations around the town for the possibility of flooding or parts of the storm hitting them, then had gone off on patrol, widening his route and keeping it farther north, over the Whitetail Woods. It wasn't his usual patrol zone, but Wind Rider didn't care...as far as he knew nopony kept that much of a watch on the area, and as such he had wanted to be there just in case. Unfortunately, a rogue cell had caught him unawares...one moment he'd been patrolling, the next a bolt of lightning had lanced across the sky in front of him, and he'd had to make his way to Canterlot, in the direction opposite the cell's path. It had been a close thing too...by the time he got his hooves on the ground, Wind Rider was soaked to the bone, shivering cold, and his ears rang from the repeated, loud thunderclaps in the air. His head pounded with a terrible headache to boot, and he staggered in an almost drunken fashion down the road a bit until he could no longer amble. Wind needed a place to get out of the pouring rain, so he ducked into the first place he could find...he didn't even read the sign overhead. The brown pegasus shivered in the doorway for a moment, taking in the room in front of him. It was a club of some kind, there was only a few other ponies there: the bartender, a bright blue pony with an equally brighter, rainbow coloured mane, another blue pegasus, this one with a white mane, and finally, another blue pegasus, this one an extremely pale blue. He pulled the wide brimmed ranger hat off his head, shaking his soaked, seafoam green mane...not that it did much, given he was basically made of water at that point, and stepped fully into the club. Unlike most of the other ponies, it was clear this pegasus was not usually one to deal with weather...he didn't have goggles, for instance, nor a proper helmet. All Wind wore was his ranger hat of pale brown, and matching coloured uniform shirt...he hadn't expected to get caught in such a violent storm, after all. That lack of equipment had nearly gotten him injured, twice, when he'd flown too low on the approach to Canterlot and nearly hit the mountainside, through a combination of heavy rain and a lack of proper vision after seeing lightning flash by so much. Even now, he blinked his mis-matched eyes, and he could still see the jagged streaks across his vision. "What a gorgeous night." he let out with a heavy note of sarcasm and glumness. He hung his hat from it's strap around his neck, letting it rest on his back, and looked around the room, taking it in consciously for the first time. He made his way to the bar, wincing a bit as he realized he was leaving a small trail of water behind...not that he had much else he could do about it...standing near the door had just left a huge puddle where he'd been standing. "Sorry, about the mess." he apologized to the bartender. "This may seem odd, given my uh, well..." the thumping headache was making it difficult to come up with the right words, so Wind Rider just looked down at his wet coat, then back up at the bartender. "But can I get some water, please?" he asked with a sheepish smile. He was parched, mostly from having flown faster than he'd ever had to try and get to Canterlot safely, and falling rain wasn't exactly something to drink on the way. After he placed his order the pegasus turned his head to fish a wet pouch of bits out of one of the pockets of his uniform, setting it on the bar, where it started to create it's own puddle. "Goddesses, it's like I'm made of water or something..." he mumbled. The dig had been a disaster. Not only were they denied entrance to the recently discovered underground temple that Whiz Kid had SWORN he and his group were granted full permission to explore. Their own meager excavation attempts had been washed away by the horrible weather that charged into their camp like a horde of rampaging minotaurs. It was only just a few days ago, when he heard that three ponies who had been messing around on old Canterlot training grounds were literally sucked underground by a nasty sink hole that had quickly formed under their hooves as they had trained. Whiz had sworn that he was granted full access to this 'Find Of The Century', but he had jumped the horn so to speak. They would eventually be granted limited access to the temple, but the site was considered under R.E.A quarantine until it was deemed safe for exploration. Who knows if another sink hole was ready to open up, and there were rumors that the temple contained items of dark magic that only the more respected and skilled mages from the university were permitted to go through. Pocket Change sighed as he poured through his notebooks, "This is why I wanted to be become archaeologist in the first place. ", the unicorn thought to himself. It was his dream to explore these lost and forgotten marvels of previous civilizations, but instead he spent his time digging through dirt, getting sunburned and all the writing! The small group was able to get some minor excavations done during the short time they were on the grounds, but they discovered next to nothing of value. The rain clouds were of a ruder variety than usual as they did not warn the ponies of the approaching storms by starting off slowly, giving off a friendly warning of sorts, "Excuse me friends, we're going to have a storm of beastly proportions in a moment, so please take your things and head off to higher grounds!" they would say if clouds were capable of such a thing. Instead they all charged into the sky, blotted out the sun and proceeded to drench the entire camp. Thankfully the ponies were able to flee without ruining their precious notebooks and equipment. The group had originally fled back to campus, but after waiting for a few hours, they decided the day was over and it was agreed upon to meet up at the local jazz club. Originally they had spent their night on open discussions and minor speculation about the site and the temple that was said to be below, but as time went by, and the drinks started to pour more frequently, their chatting had ventured into more personal and friendlier territory. This went on for a few hours, and Pocket was now the last of his little gang of archaeologists and 'shovelbums' who had remained in the club. He enjoyed it here, the drinks weren't overpriced, and the band did a wonderful job covering such classic acts as Dizzy Gallopie and Red-Tail Rodney. He had spent so much time going through one of his colleague's notebooks he did not notice the time as it rushed by. Bright Eyes had left her notebook, hoping the younger unicorn would learn from her extensive notes and sketches she kept in her book. He was amazed on how much she wrote on what little data they actually were able to collect. The sound of doors being opened and closed quickly woke the young stallion out of his daze. He glanced down first at his glass, which was now filled with mostly melted ice, and then over at the entrance. "How long have I been here? ", he thought to himself. He shrugged his shoulders as he watched the Pegasus ponies wander in, and he started to turn back to his book before he caught sight of a somewhat familiar looking light cerulean Pegasus as she cantered into the club. Where had he seen her before? While she was quite easy on the eyes, her mane had caught his eye . All those colors! Were they natural or just an rather intensive dye-job? Feeling somewhat of a gentle-colt, he made sure to order the mare a drink along with his own. Who knows, she might be some sort of celebrity! Rainbow Dash looked up at Cloudchaser's voice. "Ah, hi there! You ended up this way, too, huh? Yeah, I was even further north - what a storm! Wooo!" She tried to affect her normal energy, but it came out really tired and low-key all the same, and her eyes just wouldn't open all the way. Not, at least, till she saw who was coming in behind Cloudchaser. She certainly recognized him - she'd recognize any of them, but especially him! There weren't exactly a whole lot of stallions she'd danced with recently. Or, if she had to be honest, at all. Soarin', the Wonderbolt! Not in his Wonderbolt costume, or in his incredibly dashing dress uniform, but just himself, looking wonderfully mussed and rumpled. "Soarin!" she repeated, as she rested against the much more stable wall with her shoulder, her forelegs crossing. "Hey, hi, whatcha up to here? How bout that weather, huh?" "Ah, hi there! You ended up this way, too, huh? Yeah, I was even further north - what a storm! Wooo!" Cloudchaser nodded as Dash spoke to her. She didn't seem to have a lot of energy. She had probably been fighting the storm all day or something while Cloudchaser had been passed out face up in a puddle. Rainbow Dash was awesome like that; that's why she was the leader of the team. Chaser had a lot of respect for her and all she put into keeping them in line, even if she did work them hard when they had something big coming up. Even in her tired state, it was good to see Dash. The carefree weather mare wasn't sure what exactly to say at first; Dash probably wouldn't think very highly of her having been knocked out early on by debris. Blushing a little, her expression still kind of vacant, she opened her mouth to speak, "Yeah... that was sure something. I've totally been fighting it all day and stuff..." she lied, laughing nervously. "In fact, I was--"
Cloudchaser cut herself off as Rainbow Dash nearly knocked over a table and then stumbled around a bit. She must have been really out of it, Chaser figured, until her eyes followed Dash's to a certain stallion. Cloudchaser didn't recognize this guy, but Dash clearly did as she spoke to him. She seemed worked up about it too. She had gone all nervous and funny. Chaser smiled and nodded. It was pretty clear what was going on here! The pegasus was kind of surprised; she hadn't taken Dash as the kind of mare to get so worked up over a stallion. "Is this your coltfriend, Dash?" Cloudchaser said in a loud voice with an excited grin. "Not a bad choice! He's cute," she added in a softer but still audible whisper. Laughing and turning toward Soarin', she gave a nod and offered a hoof, "Nice to meet you, dude. I'm Cloudchaser. I work with Dashie here on the Ponyville weather team!" Martini Paradise smiled to the ponies trickling in; already she wondered what tales they had to tell about that night, both for curiosity's sake and for news about Ponyville. She smiled across the club to the sky blue stallion, raising her voice as she answered, "We're open so long as you brave pegasus ponies need a place to relax and rest your weary wings! No need to worry about this place closing tonight!" An all-night shift wasn't too out-of-the-ordinary for her! This stallion seemed familiar ... where had she seen him before? Her attention shifted to the waterlogged pegasus trailing water on up to the bar. Martini magically sent the bucket and mop she'd prepared after the mess as she smiled to the brown pegasus. “oh, it’s not a problem, who could complain about a little water on the floor after all the brave work you’ve put in today?” She smiled in amusement at his order - water on the wettest night she'd seen in a while. “Sure thing, hon, one water coming right up!” There wasn't much fancy to pour water for a pony, so she just scooped up some ice cubes and topped off the glass from a cool pitcher, then tucked some alfalfa decoratively onto the rim of the glass. “Here you go,” Martini placed the cool water in front of the stallion. The unicorn was the last of a group that had spent the better part of the night drinking and jabbering away, still they were the idea bunch of ponies to be served as they kept their glasses refreshed and not a single one of them had any alligator arms, (they tipped very well). The white coated pony glanced away from his notebooks and looked down at his glass, "Guess I might as well have just one more rum and cola..Last one for the road so to speak, and do me a favor. ", he smiled as he glanced over at the group of weather ponies who had just arrived, "Go ahead and serve them whatever they want..A pitcher of stout, a mixed drink of their choice or whatever, just as long as it's within reason and add it to my bill. They should know there's at least one guy in Canterlot who appreciates the job they've been doing. ", he waited for the bar mare to canter off before he returned his gaze back to his books, "Lady Lanceguard? Fire Waker? Steel...Oh wait..", I know that one, "He chuckled to himself as he continued to read his notes. Wind Rider couldn't help but smile a little sheepishly as she cleaned up the trail of water. Who could complain about being wet on a night like this? He would. Irrational or not, Wind felt bad for making the mare work harder than she already had to...it was late, and given the emptiness of the club, which had included one dry unicorn besides the bartender, he figured the club had either been about to close, or should have been closed, when the motley assortment of rain-drenched pegasi stumbled in. But the bartender seemed not only okay with it, but downright chipper, which made his smile turn rather genuine. And when she got him the water, he counted out the bits from the soggy canvas pouch, and gave her a warm, heartfelt "Thanks." He took hold of the glass and took a long sip, feeling better as soon as the cool water hit his parched throat. Flying that hard to get to Canterlot without any stops had taken its toll. "There, I feel normal again." he said with a chuckle. Sure enough, his voice sounded a lot less hoarse. Wind took another sip, looking over his shoulder when he heard a loud conversation. Well, whaddya know? The other pegasus stallion in the room, which he hadn't really noticed at first, was none other than Soarin', of the Wonderbolts. Heck, now that he thought about it, the mare with the bright rainbow mane looked familiar...but not in the same way Soarin' was. He'd seen Soarin' in person, once before. Not in a personal one-on-one fashion, but Wind had attended an airshow the Wonderbolts were preforming in. No, he vaguely recalled seeing the rainbow-maned one in...the newspaper, maybe? Took him a moment, then it came to him. Best Young Flyers' competition, a ways back. He took another sip of water, only really able to think to himself: cool. He looked over at the unicorn that had trotted up to the bar, offering his own tab to pay for the drinks of the others in the room. Wind Rider smiled at that. If there was one time when the goodness of ponies shone through, it was tonight. "You're alright, you know that?" he said with a chuckle. The brown-coated pegasus looked back at the bartender. "Sorry for my ignorance, but what is this place? I'm going to be entirely honest, I just ducked into the first place I could find that was open, before I melted, or had to swim to shelter." he admitted. He'd never been to Canterlot before, so this could be the most famous place in the city, and he'd have no idea. "We're open so long as you brave pegasus ponies need a place to relax and rest your weary wings! No need to worry about this place closing tonight!" 'Oh, thank the Sisters!' Soarin' thought to himself, relaxing visibly and pushing the goggles of of his eyes to get a proper look at the place. His mane sent droplets of water skittering off in all directions as he looked this way and that. He liked the atmosphere here too, it was relaxing. "Soa-squeak, crash-RIN!" Or was. He was honestly surprised to be recognized, until he saw just who it was who had done the recognizing. He remembered her, of course, from the competition a couple years ago, then the Gala and the wedding. Rainbow...flash? No, that didn't sound right. It'd come back to him, he knew. He kept a hoof on the beat of the flyers, as it was, so he known at the competition he'd see more of her. "Hey, hi, whatcha up to here? How bout that weather, huh?" She asked once she'd righted herself. Soarin' chuckled a little and nodded. "I know, crazy, right? I was in Cloudsdale when they evac'd, so I thought I'd lend a hoof. NO idea where I am, but that's cool, at least we got it taken care of, rig-" He said, trotting over to where she was to help right the table. He was interrupted by the other pegasus though, and while "Is this your coltfriend, Dash?" was informative (he remembered that 'Rainbow Dash' was her name now), it rather caught him off-guard. So much so, in fact, that he tripped over his own hooves and into the table, completely missing the rest of the comment. "Please hold still for a second. ", The friendly unicorn's horn was surrounded by a faint green glow that flashed for nearly a second. Once the glow was gone, Wind Rider's coat was nice and dry. "A simple abjuration cantrip. Fancy spell-casters who probably don't know better tend to scoff at such spells, but they do the trick. ", the spell-caster realized he might as well answer some of the Pegasus' questions, which would give the bartender more time to tend to his drink, "The name's Pocket Change, and you managed to stumble upon Canterlot's premier Jazz club, Ponyland! One of the few clubs around town that caters to the student body or working class and still be not considered a 'dive'. Interesting selection of celebrity we're seeing tonight. ", he nodded towards the other Pegasus ponies, "It's hard to miss the rainbow haired mare over there, and I think the blue stallion is part of the 'Wonder Bolts', might either be Rapidfire or Soarn'. If my ex were here, she surely would know who he is." "Now Rainbow Dash. ", he muttered to Wind, "One of Princess Celestia's Champions. I've seen the champions before, but never this close. You think that's a wig? ", he asked the stallion with a crooked smile on his face. Rainbow Dash blinked in surprise, then darted forward to help Soarin' to his hooves. "Oh, man... we're both exhausted, I guess, huh?" She laughed awkwardly, forgetting to let go of his hoof once he'd gotten up. "Coltfriend? OH, nonononono." She giggled nervously at the question. Oh, what if Soarin' thought she was telling folks that? "He's just a Wonderbolt! Well, not *just* a Wonderbolt, but yeah, I just saved his life once, and his pie, and we danced together at the Wedding the other month, and stuff like that!" She waved a hoof as if that was all just nothing, finally letting go of Soarin's hoof. "So yeah, he's pretty cool." Maximum coooooolness factor. That's the ticket! "Though we better be more careful or we'll get kicked out for destroying the club!" Why did Cloudchaser think they were going out? He was a Wonderbolt, after all! Not that dating a Wonderbolt wouldn't be *awesome! * but they weren't even acting like they were going out! As she spoke, Soarin' fell over for some reason and knocked into a table. Dash went to help him. Cloudchaser, completely oblivious, stepped ahead as well. "Whoa, dude. You okay? Guess your hooves must still be all slippery, or something," she started with a grin. "Coltfriend? OH, nonononono. He's just a Wonderbolt! Well, not *just* a Wonderbolt, but yeah, I just saved his life once, and his pie, and we danced together at the Wedding the other month, and stuff like that! So yeah, he's pretty cool." It was about then that her words evidently resonated with the rainbow maned pegasus. Cloudchaser was surprised by the revelation. A Wonderbolt, huh? That was kind of awesome. There probably wasn't any young pegasus out there who wasn't crazy about Equestria's most famed team of flyers, and she was no exception. She didn't have anything on Dash herself when it came to Wonderbolt love though. 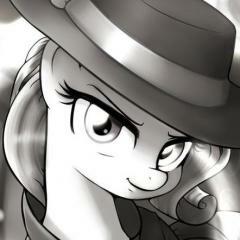 Everypony in Ponyville knew the mare was crazy in love with the team and stuff. Cloudchaser nodded. Oh yeah! That's what was going on here. "Wonderbolts, huh? Ah, I got ya! So that's why you're acting all funny and stuff. I mean you are probably the biggest obsessed fanfilly of the Wonderbolts in all of Ponyville, so it would only figure," Cloudchaser loudly deduced with a nod. Looking back toward Soarin' she smiled. "A Wonderbolt though? That is seriously pretty cool. I don't think I've ever met a Wonderbolt before. I mean, I know the captain, Spitfire, was there when we made that tornado thing, but it's not like I got a chance to talk to her or anything. It's really pretty cool that you actually know the Wonderbolts, Dash..."
Martini smiled at the white stallion unicorn and his generosity. As much as she wanted to, she couldn’t give drinks for free to all the pegasai, but it seems he could! "Why, that's so very sweet of you, hon; I’ll get yours for you right away!” Martini trotted to the center of the bar as she floated a tumbler glass over to her and scooped out a bit of ice, then gave the shelf behind her a good kick. A faint telekinetic nudge made it seem that she’d kicked the shelf in just the perfect way to knock the rum down, where she caught it on one forehoof and sent it spinning. The tumbler glass floated in so that the spinning bottle came to a stop with the slender metal spout inside the tumbler, spilling the strong drink over the clear cubes and coloring them amber. The coke required a more gentle touch, and she contented herself with cracking open the brown Colt Cola bottle with one sharp strike against the counter, making it foam over into the glass, followed up by the dark fizzy drink mixing with the amber booze. She set the tumbler down on a small, square bar napkin, tucked in a swizzle stick, and slid it across the bar to the stallion along with a bright smile. Martini returned her attention to the brown pegasus who was sounding much better after his tall glass of water. She floated a jug of ice water over to refill his glass. “This is Ponyland! It isn’t well-known outside of REA circles - it's a bar that caters to all the local military ponies and guards and their dates. The owners, though, they like to put a hoof out to any group of ponies though will risk themselves for the sake of Equestria. That's why we're open - so all you brave weather pegasus ponies can have someplace to go and relax, dry off your weary wings. I'm glad you managed to brave through and find us!" She gave a bright, warm smile - making the customers feel welcome and liked was all part of the job. Wind Rider looked over at the unicorn as he worked a spell to try him off. Instantly he shivered as warmth passed through his body, from the bottom of his hooves all the way up to the tips of his ears. "You are a life saver, my man," he thanked Pocket Change with a smile. It was better than shivering off to the side under the weight of all that water. Both he and the bartender answered his questions about the bar, and he nodded. "Ponyland, huh? I'll make it a point to fly up and visit during business hours, it's a nice place," he said with a smile. Wind Rider did have to let out a little laugh at what the bartender said though, about him being a brave weather pony. "Oh, no, I'm no brave weather pony. If I was, I'd have been better prepared for this." He chuckled and shrugged a shoulder, downing what was left of his water. "I'm just a forest ranger from Hoofington. I was out patrolling, making sure nopony was stuck out in the storm, and got blown off course...long story short, I needed to land, and Canterlot was closer, and safer, than Hoofington at the time. Give the praise to those that truly need it," Wind said with a nod toward the other pegasi in the room, smiling. "But, thank you for your hospitality. You could have closed your doors long ago, thanks for staying open. A bit of shelter's great in this kind of weather." Wind Rider smiled graciously. He looked over at the unicorn when he made a comment about the others in the room. "Soarin'," the pegasus said with confidence. He chuckled. "What can I say, I'm a pegasus. It's like, bred into us that we have to love 'em. Though I have see a few of their shows." And the rainbow-maned one was one of Celestia's Champions? Well now. Two members of some of Equestria's most famous groups, in the same place, chatting like they were old friends. Heck, they might just be...when you got to be that important, Wind Rider figured to go to meet other very important folk. Both those pegasi could probably list of people they've met that Wind would only dream of seeing up close. "A wig?" he chuckled, keeping his voice low and grinning. "Naw. Looks too natural, too good. It's either natural, or one of the best dye jobs I've ever seen." He watched the interactions between the other three pegasi with detached amusement. The rainbow-maned one seemed utterly beside herself with excitement, though granted, he probably would be too if he got to meet one of the Wonderbolts. Pocket Change smiled as the barkeep finished his drink, "Thank you my dear. ", he quickly let enough coins for his drinks, the Pegasus' drinks and a hardy tip float over her way, "I'm afraid this will be the last for me tonight. Anymore..", he quickly covered his mouth as he let out a yawn, "And I'll probably need somepony to drag me home. ", he nodded his head as she spoke of the club itself. Maybe he was confusing this for another pub he and his colleagues like to hang around. How did he know about this place, he wondered before coming to the realization that his sister's best friend who was in the R.E.A. and apparently spent her free time falling into sink holes, probably recommended this place to him. He turned his attention back to Wind Rider, "My Sun Catcher is a big fan of the 'bolts. She used to take me to nearly all of the derbies in Canterlot. Wasn't a big fan of the races, but I enjoyed the little stunt shows they did before or after the main events. And don't get me started on the mares..Spitfire..Fleetfoot..Blaze, that cute one with the blonde mane...All bouncing around in those skintight uniforms makes you glad to be alive. ", he took a sip from his glass, "Don't knock yourself. Being a ranger is some pretty heroic type work. Always gotta make sure nopony gets himself mauled by any of those wild forest animals..Or stumbles into a cave and gets lost...I spend most of my time in the hot sun digging through dirt, trying to find lost artifacts from forgotten times. So far the only thing I've learned so far is that our ancestors really enjoyed making pots. Lots and lots of pots." "He's just a Wonderbolt! Well, not *just* a Wonderbolt, but yeah, I just saved his life once, and his pie, and we danced together at the Wedding the other month, and stuff like that!" "...You are probably the biggest obsessed fanfilly of the Wonderbolts in all of Ponyville, so it would only figure,"
Soarin' chuckled a little as Rainbow Dash helped him to his hooves. It was good to know he wasn't the only pony with one of THOSE friends. He actually remembered the incident with the pie, the gala a couple years back, and what an odd one that had turned out to be. He was about to say something when he heard the lavender mare speak up again. "It's really pretty cool that you actually know the Wonderbolts, Dash..."
Ah, now this deserved some attention. "Hey, we're just athletes. Dash is the one rescuing ponies and pies at the drop of a feather, and she's the only mare I've ever seen make a boom like that once, much less, what, three times?" he said, smiling amiably at the rainbow-maned pegasus in question. "I thought the one for Pincess Mi Amore's wedding was pretty impressive, by the way! You went from standstill to boom in less than three seconds." Thankfully, Soarin's words broke through that mental loop. "Awww, well," she said energetically, a her grin growing more brilliant and eager. "You know. I am kinda awesome that way. Fastest Equine alive!" She grinned, and ran her hoof through her mane again, lost cause though it was. "Though, y'know, you're not *just* athletes! You're the most precise-flying, awesome, spectacular, flashy, artistic athletes there are! And you defend the country when there's monsters and stuff!" Cloudchaser just listened as Rainbow Dash and the Wonder Bolt dude complimented each other, he acting all modest about it while Rainbow Dash acted like Rainbow Dash. Chaser grinned widely and nodded. Wasn't much to pick up from this talk that she didn't already know. Rainbow Dash was awesome and so were the Wonderbolts. Every pegasus in Equestria knew the latter to be true and at the very least every pegasus in Ponyvile knew the former. "Yeah, even back in Las Pegasus, everypony knows the Wonderbolts and knows they're awesome. You dudes are like legend and stuff," Cloudchaser said friendly smirk, looking toward Soarin'. "Also more than aware that Dashie here's amazing. She's a great leader; keeps us all in top shape and stuff. She's super popular. She even has her own fan club," Cloudchaser said, nodding steadily as she did. "I considered joining that once, but Flitter told me I was too old and that I'd just embarrass myself..."
"I didn't know Dash was in the business of saving pies though? That's kinda cool. Pie is good stuff," the mare, nodding some more. Pie actually sounded pretty good; she was really kinda hungry. She'd have to see if there was anything to eat in this place at some point. Martini Paradise raised one eyebrow as she listened to Wind Rider's modest demurring and chuckled softly. "so you were out in the deep, dark forests, in the wind and rain, looking to make sure nopony was stranded in these frightening storms? Maybe you aren't a weather pony but you sound every bit as daring and courageous to me." She levitated the cold pitcher of ice water to the brown pegasus' glass and topped it off. "I think you'll fit in just fine here tonight; I am sure you have a few interesting stories of your own from your patrols of the wooded lands." Martini's shifted her attention to the hefty amount of bits that floated before her from the one other unicorn in the bar; her own green magic took over from the stallion's yellow magic as she floated the currency to the register. "I'm sure the pegasai here will really appreciate your generosity, and don't worry about having to leave - we do have a few rooms upstairs to rent for those too tired or too woozy to try and get home. You are welcome to one, your bits here more than cover it." Of course, speaking of the other pegasai, she wondered if they were actually planning to order anything. The two mares seemed too enamored of the Wonderbolt stallion among them. She wasn't sure if that rainbow-maned one was just fanfillying or she had some serious romantic crush on him. It could be one and the same, of course - it certainly seemed like that with her own daughter and this same Wonderbolt. Martini chuckled at that last part, imagining Sunrise Beach standing there being jealous of some older mare "competing" for the affections of her dream stallion. Wind Rider grinned at what the unicorn was saying, hiding it behind a long sip of water. It was rather amusing to watch the two blue pegasi fanfillying over the Wonderbolt, who seemed to be taking it rather in stride...or, if anything, both the 'Bolt and the rainbow-maned one seemed to be complementing each other in turn, from what he could tell. Well, that, and neither were exactly talking quietly, and the bar was mostly empty. In a way though, it was interesting...he'd always had a certain perception of famous ponies, that they were always all about business and the like. But no, now he was getting to see a more pony side of one of the more well known Wonderbolts, rubbing shoulders rather casually with the general public and not really focusing on his job. It was, in a word, interesting (to watch, which would technically be three words). Wind Rider looked back at the bartender, who was complementing him on what his job had been, all while levitating the water over to top off his glass. "Thank you, Miss...?" he began, smiling. "Guess I'm a lot more modest than I should be. I've not got many stories, but enough to pass a bit of time while we wait out this rain," he said with a chuckle. "And thank Celestia most ponies had the right idea and kept indoors, I didn't see anypony while I was out there. Though staying inside might not be the best either...not in Hoofington at least. Water's rising quite a bit, last time I was there." He shrugged, as there was nothing he could do about it here. Another sip of water, he looked at the unicorn. "Heck, I don't think I got either of your names. I'm Wind Rider," he said with a smile. Might as well get to know the unicorn paying for his drinks, and the bartender providing them. The unicorn returned a somewhat weary smile,"My thanks, but my place is not that far from here, and I'm more mentally tired than I am physically. Still, I don't think my sister would believe me if I told here I was in the same bar as the famous Rainbow Dash and an actual real live Wonder Bolt. Probably flip her wig.. If she wore one. ", he took a sip from his final drink of the night before responding to the stallion's question, "I'm Pocket Change, wandering archaeologist and hopefully soon be be famous delver of the deeps and explorer extraordinaire. I just pray the horrible rain didn't completely ruin our little dig site, but if it did, 'C'est la vie'." He overheard mention of a 'pie being saved' from the other table and started to wonder if this was code for something far more serious. Soarin' chuckled and smiled brightly. the effect was ruined when his mane chose this moment to fall over his eyes, gravity finally winning out over...actually, even Soarin' wasn't sure why it usually stayed up. "The pie thing was a little embarrassing, honestly. Ponies seem to remember the oddest things, heh." he said, using a hoof to wipe his hair out of his eyes. "Besides, tonight I think almost every pegasus in Equestria is a hero. Between the evacuation and the weather damage control, we all had our work cut out for us. We should probably order something to drink or eat though, since the shop was nice enough to let us stay here." He smiled across the room to the proprietor, and ambled over to one of the tables.